The Donegan Clip-On Binocular Magnifier is ideal for small tasks that require your hands to be free, such as reading fine print, sewing, art projects, fly tying, and more. 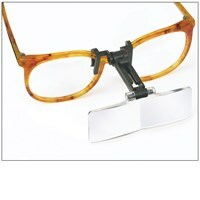 Donegan clip-on flip-up magnifiers are lightweight and easily clip onto most eyeglass frames or can be used with a comfortable binocular frame. The dual prismatic lens system is designed to ease eye strain and increase accuracy, and this model provides 2x magnification at 10-inch focal length. Convenient binocular frame included.